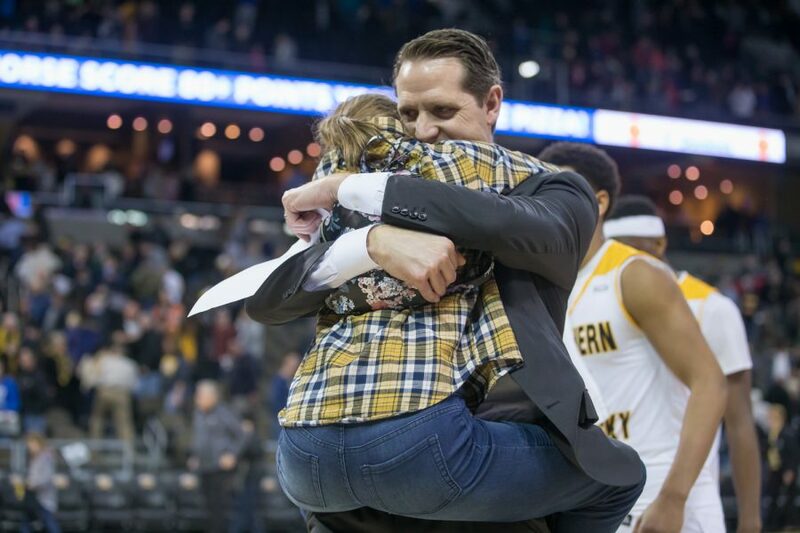 Head coach John Brannen celebrates the Norse win with one of his daughters. The NKU men’s basketball team defeated Green Bay 86-80 in front of a sold out lower bowl in BB&T Arena. The Norse improve to 19-7 and are 12-2 in Horizon League play. Green Bay has now lost three straight and are 10-18 and 5-10 in conference play. With the win and a Wright State loss to Milwaukee on Saturday, NKU holds sole possession of first place in the Horizon League. Tyler Sharpe came up big for NKU, making a contested three with 4:51 left to put the Norse up by four, 75-71. A minute later, Lavone Holland II drove to the basket and made a layup to put the Norse up 77-71. Sharpe would hit two more threes in the closing minutes that helped guide the Norse to victory. “When you got a guy who can space the floor-if you don’t have guys who can make shots then they can’t space the floor and (the defense) can load up on your main guys- Tyler opens those things up,” NKU head coach John Brannen said. Holland was crucial during the victory, scoring 17 points on 6-12 shooting and chasing down five rebounds. Holland, who has been battling knee tendinitis, was able to control the tempo in the final possessions to keep the Norse on top for good. Khalil Small scored 20 points on the night, but was held to just 5-14 from the field. Cohen was 3-5 from three and finished with 18 points and seven rebounds. It was a physical game to say the least, and the whistle had Brannen very upset at times. “That’s about as animated as I’ve been on the sidelines since I’ve been here,” Brannen said. The two teams combined for 43 fouls in the contest, resulting in 42 free throw attempts. The Norse missed just one of their free throws, going 19-20 from the charity stripe while Green Bay went 17-22. The fouls prevented the Norse from building a sizable lead in the first half. NKU shot just over 57 percent for the first half and held the Phoenix to just 33.3 percent shooting. NKU also tracked down 22 rebounds while allowing Green Bay to grab just 15. NKU had nine players score in the first half and held a 47-37 advantage at halftime. Holland scored eight points in the half while Small led all scorers with 13 points in the half. The opening minutes of the second half were a struggle for the Norse, as their 10 point halftime lead was cut to three after threes by David Jesperson and Cohen. After the Norse pushed the lead back to seven, Green Bay came back to take a 63-62 lead after a TJ Parham three with 11 minutes remaining. For the next four minutes, the Norse and Phoenix traded free throws and the lead until the Norse took the lead for good with two Holland free throws with 7:39 remaining. NKU will look ahead to Friday, when the Norse will head to Dayton, Ohio to take on second place Wright State. The game will tip-off at 9 p.m. and will be available to watch on ESPNU.